Vancomycin is a commonly prescribed antibiotic used to treat children and adults with serious infections. Here we review some of the most common indications for vancomycin use and important safety considerations for health practitioners using this drug in pediatric patients. We discuss dosing guidelines, monitoring parameters, and vancomycin’s pharmacokinetic and pharmacodynamics properties. 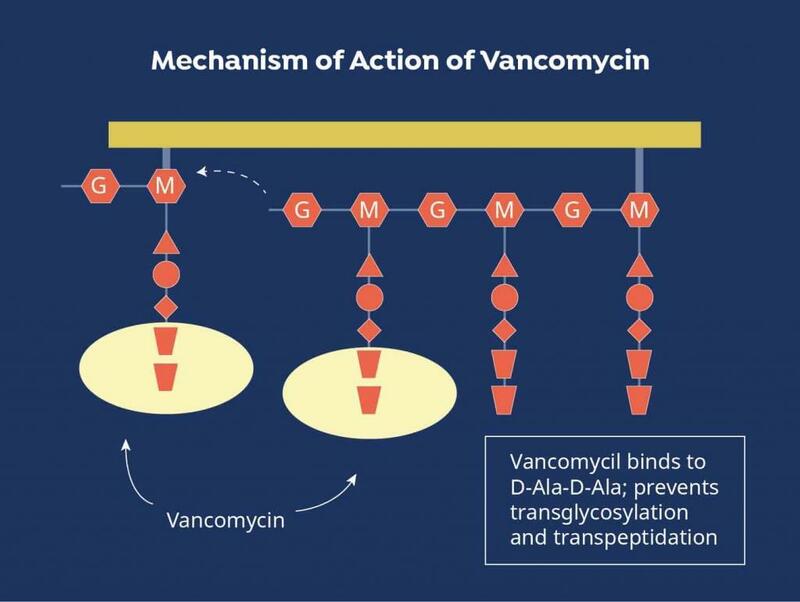 What are Vancomycin’s Uses and Mechanism of Action? Due to the serious nature of these infections, vancomycin is often chosen empirically to initiate treatment prior to pathogen identification. It can also be brought on board to broaden the antimicrobial spectrum when other agents are ineffective or if the causative bacteria are found to be resistant to other medications. Vancomycin exhibits antibacterial activity by disrupting the peptide structure of the bacterial cell wall during the synthesis process. Vancomycin doses are calculated using the patient’s total body weight. For children one month to six years of age the suggested empiric vancomycin pediatric dose is 40 mg/kg/day divided into four doses given every six hours. For those aged seven to 18 years old the recommended vancomycin pediatric dose is 40 mg/kg/day divided into three doses given every eight hours. If the patient is immunocompromised or suspected to have osteomyelitis, an infection of the central nervous system (CNS), or an infection with methicillin-resistant staphylococcus aureus (MRSA), the empiric dose is 60 mg/kg/day divided into four doses given every six hours. No more than two grams should be administered per dose and the maximum total daily dose recommended for both children and adults is six grams. 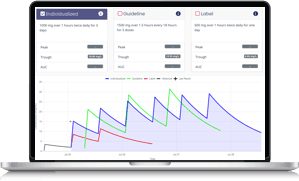 Dosing calculators are available in clinical references and online to assist prescribers in calculating the appropriate patient dose. Pediatric vancomycin dosing adjustments are based on two factors: pathogen sensitivity and serum trough levels. If a culture is performed, the minimum inhibitory concentration (MIC) can be determined and used to guide trough levels. If this information is not available a trough concentration of 10-15 mcg/mL is recommended for most infections. If the infection involves the CNS or bone or is hospital acquired or caused by MRSA a trough of 15-20 mcg/mL should be targeted. Is a Vancomycin Loading Dose Needed? Based on infection type and severity a loading dose may be given to ensure that vancomycin levels rapidly achieve therapeutic plasma concentrations. The vancomycin loading dose is a large dose given once at the onset of therapy to rapidly achieve a therapeutic drug concentration in the body. One of the most common pathogens vancomycin is used to treat is MRSA. 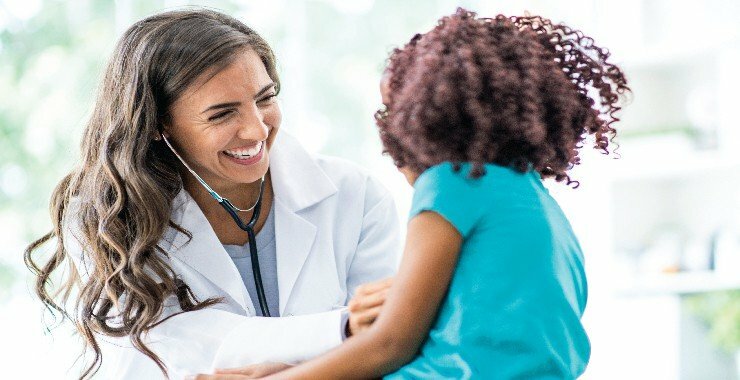 A pediatric modeling study estimated the value for the 24-hour area under the curve (AUC24) divided by the MIC for children receiving doses of 40 mg/kg/day or 60 mg/kg/day. This value correlates to patient outcome and a value greater than 400 is associated with a better prognosis. Calculating the AUC24/MIC for a dose of 40 mg/kg/day predicted a value less than 400 while calculating the AUC24/MIC for a 60 mg/kg/day dose resulted in a value greater than 400. As an AUC24/MIC of more than 400 is associated with better outcomes in adults, the authors concluded that the pediatric doses recommended by current guidelines may be insufficient in children with suspected or confirmed MRSA infections. A chart review of pediatric patients indicated the current recommended doses of 40-60 mg/kg/day are insufficient to achieve the target trough level of 10-20 ng/mL. Serum vancomycin trough levels are required to ensure treatment goals are being met. Vancomycin is normally administered intravenously (IV) due to low oral bioavailability. Occasionally the oral or rectal routes are used for gastrointestinal infections. Vancomycin pediatric doses are given every 6 to 12 hours. If other antibiotics are being given simultaneously, administration should be timed to avoid potential drug interactions or incompatibilities. A standard infusion rate of 1 g over 60 minutes is commonly used and the infusion duration varies based on the quantity of drug required. The infusion rate should not be increased above this rate due to the risk of developing red man syndrome, an infusion-related reaction that causes an erythematous rash to develop on the upper body and face. The administration interval for vancomycin may need to be adjusted based on the patient’s renal function. Vancomycin is dosed to achieve a goal trough level that is determined by the infection type. In children it may be necessary to monitor troughs more frequently than in adults to ensure the patient receives the appropriate dose. Moreover, as the vancomycin pediatric dose is calculated using total body weight it is critical that prescribers take the time to ensure an accurate body weight is obtained. Concomitant use of vancomycin and anesthetic agents in children has been associated with histamine-mediated reactions characterized by erythema and flushing. The prescribing information instructs healthcare professionals to administer vancomycin at least 60 minutes prior to the anesthetic to decrease the chance that this will occur. Nephrotoxicity is an important safety concern in both adult and pediatric patients treated with vancomycin. One retrospective study of 167 patients found that this side effect occurred in 14% of vancomycin treated patients. Numerous publications indicate that an intensive care unit admission or critical illness and the concomitant administration of other nephrotoxic medications increases the risk of acute kidney injury. Evidence on whether a trough level of greater than 15 ng/mL is associated with an increased risk of nephrotoxicity is contradictory. The most common adverse events observed with vancomycin use are mild and include nausea, vomiting, abdominal pain, diarrhea, flatulence, headache, back pain, fever, and fatigue. Regular monitoring is recommended to mitigate these risks. 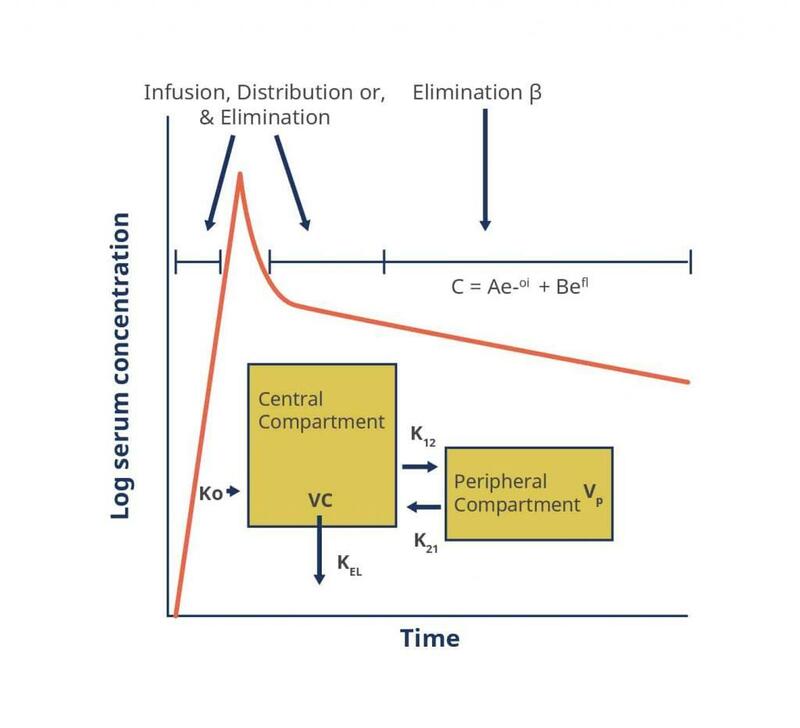 Serum concentration is normally collected at steady state trough which usually occurs prior to the administration of the fourth dose. Peak concentration has not been shown to correlate to either toxicity or efficacy and is therefore not monitored. Serum creatinine should be assessed regularly as a measure of renal function. Clinically, symptoms of infection should be assessed regularly. These include body temperature and heart rate. Blood cell counts can also be helpful markers of infection improvement or worsening. To fully understand the dosing paradigm for vancomycin a brief discussion of its pharmacokinetics and pharmacodynamics is necessary. The pharmacokinetics of vancomycin can be described using either a 1-, 2- or 3-compartment model. Absorption: The bioavailability following intravenous administration is 100%; that of orally administered vancomycin is less than 10%. Distribution: With intravenous infusion, distribution typically occurs over a period of about 30 minutes. In children the volume of distribution is 0.26 to 1.05 L/kg. It is important to note this is more variable than that in adults (0.5 to 0.9 L/kg). Metabolism: This is very limited. Excretion: Vancomycin is eliminated renally with 80-90% excreted unchanged in the urine. Clearance is slightly higher in children (1.2 mL/kg/min) than in adults (1 mL/kg/min). There are relatively few human pharmacodynamic studies to guide clinicians on how to best monitor efficacy and predict patient outcomes. However, because the bacteriostatic activity of vancomycin is both concentration and time dependent, targeting an AUC24:MIC ratio is now becoming accepted as the most appropriate target. For hospitals without pharmacokinetic modelling software, it is often clinical practice to monitor serum trough levels as a proxy for AUC. Recent evidence in adults, however, suggests that this may be a suboptimal approach, leading to higher than necessary AUCs and increased risk of nephrotoxicity.